If you want to see more than the Vegas lights at night on a different scale, you can do so when you plan a trip to Vegas. Las Vegas makes it easy to enjoy a fun time, especially when you can throw in a one-day journey to the Grand Canyon. By taking the trip, you can enjoy everything Vegas has to offer while also exploring the surrounding natural sites. When making plans for this type of trip, contact us here at Grand Canyon Destinations. We feature Vegas Grand Canyon tours by luxury bus. All you need to do is sit back and relax in your comfy adjustable seat with adjustable head and foot rest. Savor the scenery through panoramic windows and get up and stretch your legs when we stop at the Hoover Dam. We feature tours to the South Rim and West Rim and stop off at Hoover Dam. You will experience the best Grand Canyon tour today when you book travel on one of our luxury Mercedes buses. Why should you travel by car when bus travel is more convenient, relaxing, and affordable? We also provide tour guides who will give you interesting details about the sites along the way as well as attractions within the Canyon. No trip should make you feel stressed or uncomfortable. That is why you will find it easy to book one of the Vegas Grand Canyon tours we offer by luxury bus. When you book a Hoover Dam and Grand Canyon trip through Grand Canyon Destinations, you will be picked up in the morning at your Vegas hotel. After pick-up from your hotel, you will head to the first stop, or Hoover Dam. 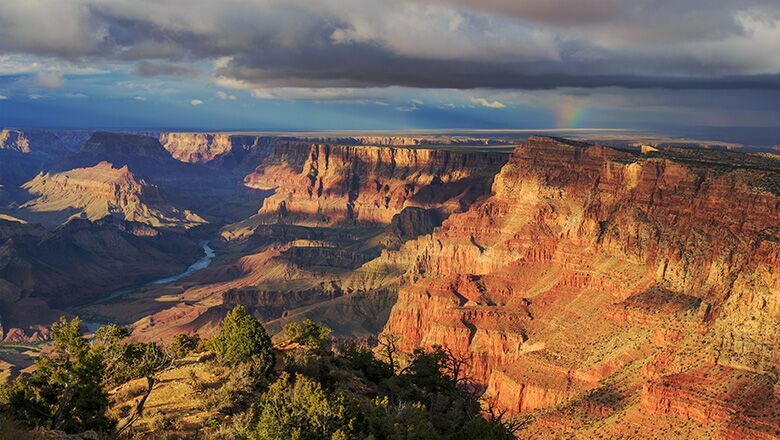 This first stopover will prepare you for the beauty and majesty of the Grand Canyon. Once you are in Grand Canyon National Park, you can arrange to cycle, ride horseback, or schedule a helicopter ride. You can also take one of the paths that can be completed in 30 minutes to an hour. All these trails are considered easy and safe. If you would like to learn more about the Canyon, contact us here at Grand Canyon Destinations. We can fill you in on small group trips, hiking trips, and trips to the South Rim and West Rim. Know all you can about the Canyon first. That way, you can more easily choose a bus trip that will meet your preferences. Just give us a call. We’re here to help.